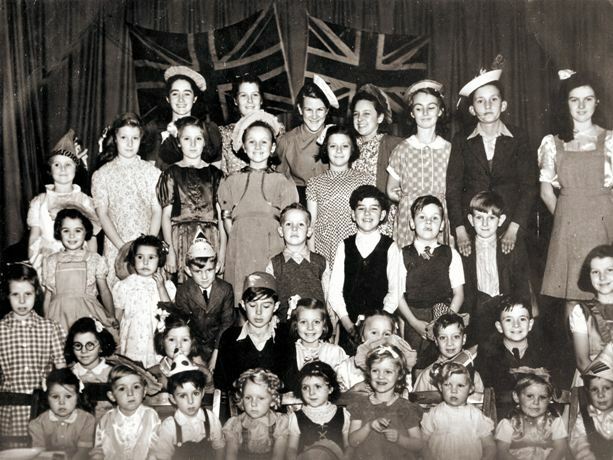 The attached photograph belongs to my Mum who believes it's of children attending the New Road residents VE Day party inside the Methodist Hall, which is at the Hamilton Road end not quite opposite The Royal Oak pub; I hope that the project's many supporters might not only enjoy seeing the photo but may be able to help identify one or two others? Please email if you can help. Mum's also certain that the three Holloway children in the photo were related. Dennis Rayner added (April 2014): I am in the front row, second from the left. I was 4 when the picture was taken and I lived at 21 New Road. I now live near Portsmouth. Alongside me to my right is my cousin Sheila Nuthall who lived at 42, Pottery Road. She now lives in Canada. I have lots of happy memories of Brentford including storing bicycles for Brentford FC football matches. For 4 years I worked after school each day at Rattenbury’s bringing in the outside displays and putting up the heavy shutters. I also worked all day on Saturdays as a general dogsbody. My pay was 25 shillings or £1-25 per week. This was in the late 1950s.